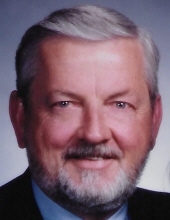 KENNEDY, Leland M. "Lee" - Age 77, of Fenton, died Friday, April 12, 2019. Services will be held 11:00 AM Monday, April 15, 2019 at Sharp Funeral Homes, Fenton Chapel, 1000 Silver Lake Road, Fenton. Chaplain Don Bennett officiating. Burial in Oakwood Cemetery, Fenton. Visitation will be held at the funeral home Sunday from 1-8 PM and Monday from 10 AM until the time of the service. Those desiring may make contributions to the Capuchin Soup Kitchen, 1820 Mt. Elliott St., Detroit, MI 48207-3485. Lee was born May 30, 1941 in Detroit, the son of Leland M. and Berniece (O'Brien) Kennedy. He was a 1958 graduate of Redford High School and attended Wayne State University. He married Arlene Fitz May 25, 1963 in Detroit. He had resided in Fenton for the past 43 years coming from Detroit. Lee retired as a Regional Sales Manager in the Pharmaceutical Industry. He was a member of St. John the Evangelist Catholic Church. He also was a member of the Loyal Order of the Moose #2225 in Florida, Spring Meadows Country Club in Linden, and the U.S.G.A. Surviving are: his wife of 55 years, Arlene; son, David (Michelle) Kennedy of St. Clair; daughter, Leanne (Brian) Becker of Fenton; grandchildren, Katie, Scott, Matthew, Allison, Rachel, and Rylie; brother, John (Katherine) Kennedy of Naples, FL; sisters, Judith (Ray) Sturdy of Plymouth and Betsy Lynn Kennedy of Clawson; sisters-in-law, Lorraine (Bill) Mazzetti of Oxford and Linda (Ed) Mauro of Metamora; and several nieces and nephews. He was preceded in death by his parents. Tributes may be shared at www.sharpfuneralhomes.com. To send flowers or a remembrance gift to the family of Leland M. "Lee" Kennedy, please visit our Tribute Store. "Email Address" would like to share the life celebration of Leland M. "Lee" Kennedy. Click on the "link" to go to share a favorite memory or leave a condolence message for the family.